Parfum bébé Nature et Senteurs : le "parfum bébé pharmacie", parfum enfant naturel mixte, parfum sans alcool, hypoallergénique. Nature et Senteurs Baby Perfume: baby girls and boys have their own Provence scented natural perfume! Baby Perfume: a collection of Provence natural scent perfumes for babies, girls or boys, alcohol free and hypoallergenic. They are available in 3 different displays including a “baby perfume giftbox”. Voted “Best Baby Perfume of the year” in 2015, Nature et Senteurs Baby Perfume will delicately leave its natural scents of Provence on your baby’s skin. Alcohol free scented water, delicately perfumed, made of natural floral water and aromatic extracts: it totally respects the delicate skin of your baby. Because the security of your baby is a top priority, Nature et Senteurs Baby Perfume is natural and hypoallergenic. It has been clinically tested to safely perfume your baby. Nature et Senteurs Baby Perfume: an alcohol free natural product enfolding your baby with a delicate, soft, sweet and irresistible scent. Baby has his/her own perfume too! Made with natural ingredients from Provence, Nature et Senteurs Baby Perfume is a mix of sweet and new floral scents calling for all 3 olfactory families: hesperidia, floral and musky. Your baby girl or boy will be wrapped up in a delicate, soft and unforgettable scent. Made by a renowned perfumer, Nature et Senteurs Baby Perfume benefits from a high quality know-how together with great respect of your baby or kid’s skin. Innovation, quality and security at an affordable price, as sweet as your baby! Harmless Baby Perfume: Nature et Senteurs Eau de Bébé, a guarantee of top quality for complete safety. Nature et Senteurs Baby Perfumes are natural, hypoallergenic and clinically tested to safely perfume your baby. Nature et Senteurs Baby Perfumes combine a high level of natural ingredients together with a soft scent for your baby. The composition of the Baby Perfume bans all the dangerous ingredients such as parabens, phthalates and phenoxyethanols in order to offer the greatest safety and protect your baby. 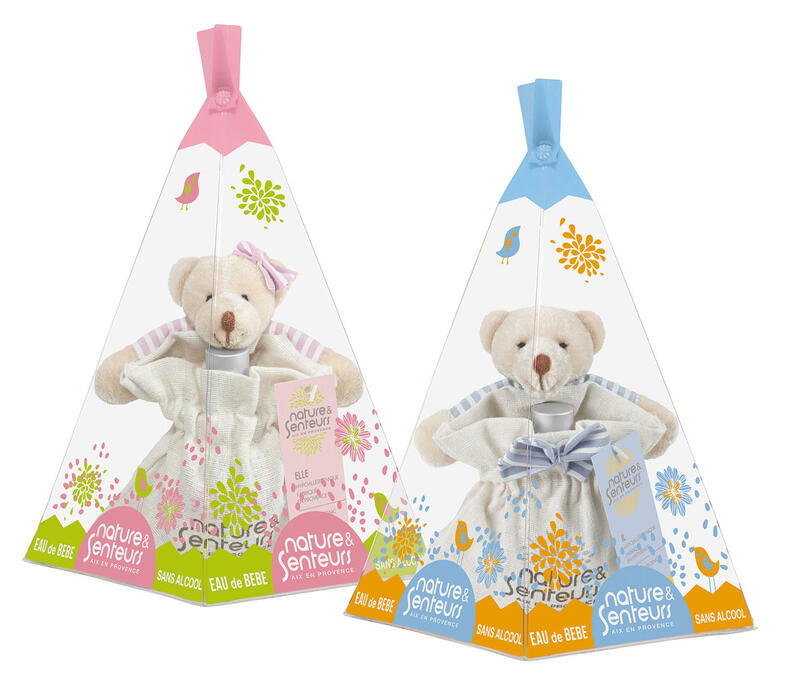 Nature et Senteurs Baby Perfume: three different displays for three different moments! Nature et Senteurs has taken into account mums’ lifestyles and different times of the day to perfume babies. • “Bébiou” Baby Perfume giftbox including a plush toy. • “Il” or “Elle” Baby Perfume, presented in a reusable “tepee” shape case, a must have of the childhood years. • Mini format Baby Perfume you can slide in your nursery bag as baby will also appreciate being perfumed all day long! Thanks to its nice giftbox, Nature et Senteurs Baby Perfume is a perfect birth gift! Think about it! How should you perfume your baby with Nature et Senteurs Baby Perfume? Number 1: if you want to perfume a new born baby, you should always spray linens and clothes from a 15cm distance. You can also put some perfume in the palm of your hand and gently rub your baby. Number 2: pour some Nature et Senteurs Baby Perfume in the water of your iron. Your baby’s clothes will then be delicately perfumed. Number 3: put some Nature et Senteurs Baby Perfume on your baby’s hair brush or comb before you brush his/her hair. Nature et Senteurs Baby Perfume: characteristics of a perfume for babies sold in pharmacies. • Composition: maximum natural elements with a minimum of 95% of natural ingredients. • Alcohol free, without paraben, phtalate, colorant nor phenoxyethanol. • Formats: 15ml and 50ml sprays. • Selling points: exclusively in pharmacies. From 2011, PARENTS magazine has been granting this great award to the best products for the bath, perfumed waters and milks, massage oils and other moisturizing creams for babies. This year, a jury composed of the editorial journalists, of Sylviane Deymié (Chief of the Childcare department), of 11 mums (readers of the magazine on line parents.fr) and of the Godmother Anne Décis, actress in the renowed series « Plus belle la vie » and mum of 2 little girls (Margot -5 and June -6 months), tested a selection of more than 60 products, all launched between November 2013 and October 2014. Evaluated on different criteria such as the efficiency of the formula, sensoriality, fragrance, design, ergonomy of the bottle, Bébiou seduced the jury by its “fragrance as fresh and soft as a baby’s skin” and its “hypoallergenic and mixed formula” above all. The jury also appreciated the giftbox as it was considered “a perfect birth gift thanks to the plush toy”.